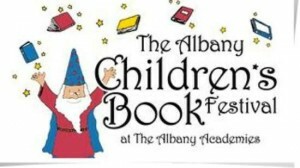 The Albany Children’s Book Festival is now six years old, and for five of those six years I exhibited and sold my books at one of the 60 or so author tables. 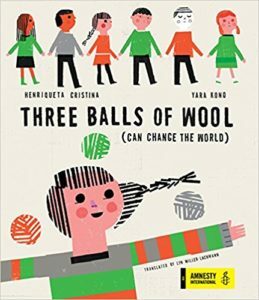 This year, the festival’s date moved from late April to the beginning of November, and I decided to take a year off — not because of the date change but because I’m waiting for the publication of The World in a Second, the picture book I’ve translated from Portuguese, and Surviving Santiago in order to go back onto the book festival circuit. Next year will be a kind of career reboot for me, so I took this opportunity to see the festival from the other side of the table — as an attendee meeting authors and getting to know their work. I arrived at Albany Academy a couple of hours later than expected because I started reading one of my Cybils books and couldn’t put it down. The schedule-altering book was Edith Pattou’s Ghosting, a novel-in-verse from eight different viewpoints recounting the before and after of a prank at a cemetery that leads to the shooting of four of the teenage characters. When I got to the festival, it was quite crowded, and I arrived just in time to see a presentation by my friend Elizabeth Zunon on how she creates the illustrations for her picture books. Her descriptions of her research process especially interested me, because I ended up doing photo research for one of the spreads in The World in a Second after I discovered an inaccuracy in the original Portuguese edition. More on that in an upcoming blog post. 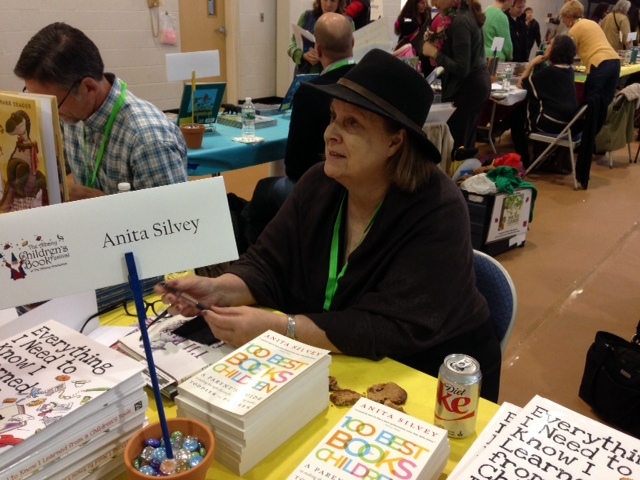 Anita Silvey talks to a young writer (not pictured because I don’t add photos of children without their grownups’ permission). After Liz spoke, I hit the exhibits, first running into Anita Silvey, who I saw the night before at a dinner for the out-of-town guests. Anita is a former editor of Horn Book and a good friend to children’s book creators. 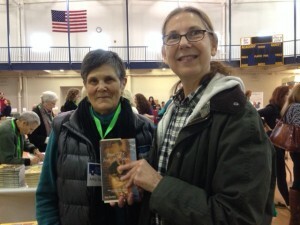 She was at the festival with her new Children’s Book-a-Day Almanac. (Right now for the Cybils, I have to read two books a day, though.) She told me about her new authorized middle grade biography of Jane Goodall, which is coming out in late spring 2015, and I look forward to reading it and reviewing it for The Pirate Tree. Next in the line of tables was Steve Sheinkin, whose award winning books include Bomb! The Race to Build — and Steal — the World’s Most Powerful Weapon and The Port Chicago 50: Disaster, Mutiny, and the Fight for Civil Rights. He recently moved from Brooklyn to Saratoga Springs, New York, in search of more living space for less money and greater accessibility to speaking engagements that can only be reached by car. His advice gave me pause, especially since my husband and I are planning to move to New York City in the spring. However, there’s always the bus, and New York City is far better situated for getting places by airplane. With Rochester author Vivian Vande Velde. I asked Steve about how he chooses his topics to explore, and he said that he has to be fascinated with them, and there have to be enough sources. Several times he has fallen in love with a topic, only to discover that the sources were inadequate or inaccessible. Steve is one of the keynote speakers at next week’s Teen Book Festival in Clifton Park, where I used to live, and he will also be speaking at the ALAN Workshop in Washington, D.C., right before Thanksgiving. I won’t be at the Teen Book Festival, but I promise a picture from the ALAN workshop since I inadvertently deleted the one I took on Saturday. 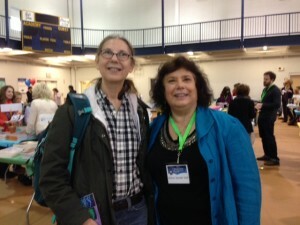 With author Amy Gordon, who grew up in Rio de Janeiro. There was a large contingent of authors from Rochester, including Alvin Ho series creator Lenore Look, with whom I had dinner on Friday night, and Vivian Vande Velde, who writes everything from picture books to young adult. Vivian and I took photos and promised to link to each others’ blogs because she’s as dedicated and enthusiastic about blogging as I am. Today, I read on Facebook about a prominent YA author who has decided to give up blogging because it has become a chore that cuts into her writing time. Some of us, though, see blogging as a way of expressing ourselves outside the confines of our novels, and of providing insight into our writing process and the things about which we write. I was thrilled to find out that Vivian’s table mate, Amy Gordon, spent much of her childhood in Brazil and like me speaks Portuguese. I bought one of Amy’s books, When JFK Was My Father, because the main character is sent from her home in Rio de Janeiro to a boarding school in the United States. Wannabee the Dog wishes she could be in the book, but her molded plastic nose just isn’t good enough. Next up was one of the SCBWI co-Regional Advisors, Nancy Castaldo, showing her brand-new and already acclaimed nonfiction title Sniffer Dogs: How Dogs (and their noses) Save the World. I brought one of my Lego canines, Wannabee, to see what she’s missing due to her rather insensitive molded plastic nose. I missed Nancy’s earlier book signings, so this was a great opportunity to get a copy signed. 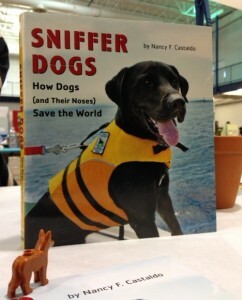 This is going to be a cherished gift for a dog lover, and I know plenty of those. 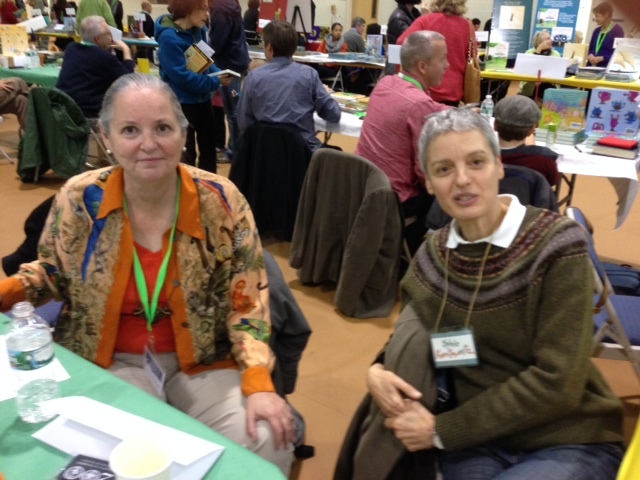 My old friends from the greater Capital District, picture book author/illustrator Sylvie Kantorovitz and MG/YA author Patrice Kindl, also shared a table. I hadn’t seen either of them in a while, nor had I seen Eric Luper and Jennifer Roy — all people who encouraged me when I was just starting out. When I explained how I had come to change publishers, they offered encouragement and support, helping me to realize that things like this happen to almost every author at one time or another, and it’s the result of bad luck, not bad writing or bad behavior. In fact, landing a new publisher so quickly serves as a very positive statement about one’s writing. Authors Patrice Kindl (left) and Sylvie Kantorovitz. A little more than a year ago, the venerated Manchester, Vermont independent bookstore Northshire Bookstore opened a branch in Saratoga Springs — a much-needed move for that community since the very large Border’s closed with that company’s bankruptcy. Having such a well-respected indie is a huge net gain for the people of Saratoga Springs, and Jessica and her staff did an excellent job of making the books available and selling them at this festival. 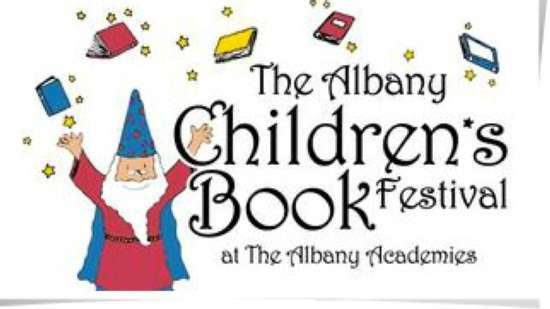 I’m looking forward to working with Albany Academy librarian Karen Schimmer, the wonderful volunteers, and Jessica and her staff when I’m back on the author side of the table in for the Seventh Annual Albany Children’s Book Festival in November 2015. 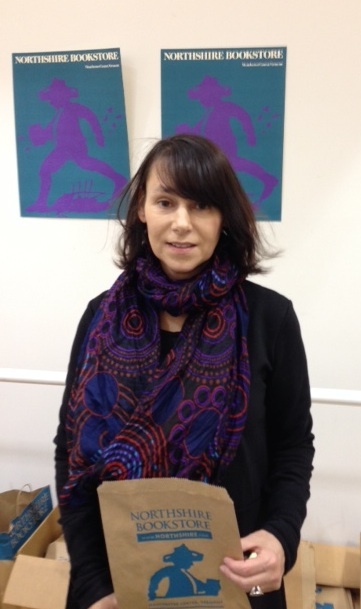 Thank you, Jessica and Northshire Bookstore! See you next year! What a fabulous day. I’m quite jealous o you. I wish I could been there with you. I wish you could have been there too! Please let me know when you’re going to be in NYC next and we can get together. So lovely to see your smiling face, Lyn! And Vivian Vande Velde! I didn’t know she was from Rochester. Love her books! Thank you, Linda! I usually try to avoid putting my picture on the blog, but these lovely authors insisted! And I enjoyed meeting Vivian in person because I only knew her through her books as well.